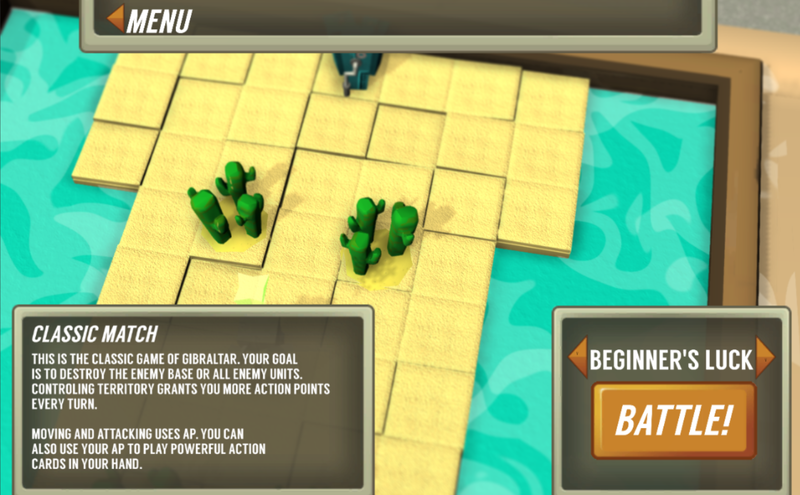 Gibraltar is a light-weight, turn based strategy game in which players compete to control territory. The more territory you control, the more moves per turn you can make. Those moves can be split up between your pieces however you want. I call Gibraltar a lunchtime game because it's meant to be played during spare time like during lunch or the back of class (when you should be paying attention). It's a throwback to games that I played and invented as a kid. It takes inspiration from Advance Wars, Hearthstone, games like Backyard Football and Backyard Baseball as well as Go, a Japanese board game. I love the excitement and intensity of sitting around a table, computer or Gameboy and pitting your wits against friends. When I started making Gibraltar, I wanted to steep it in that same mixture of camaraderie and rivalry that I felt while playing Advance Wars years ago. I think of Gibraltar as a "lunch-time game" because I want it to feel like a game I would have played with my friends during lunch-time or recess as a kid. he game board is divided into a grid. 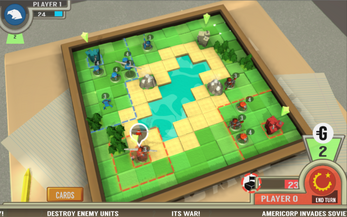 Players can control grid squares by capturing nearby buildings or by deploying special Disrupter units, which can move around the board and take territory. 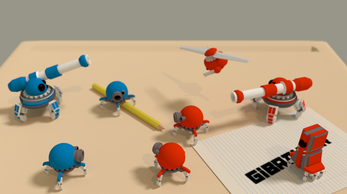 The players have a small arsenal of units to defend their territory from encroaching enemies, each with their own strengths and weaknesses. 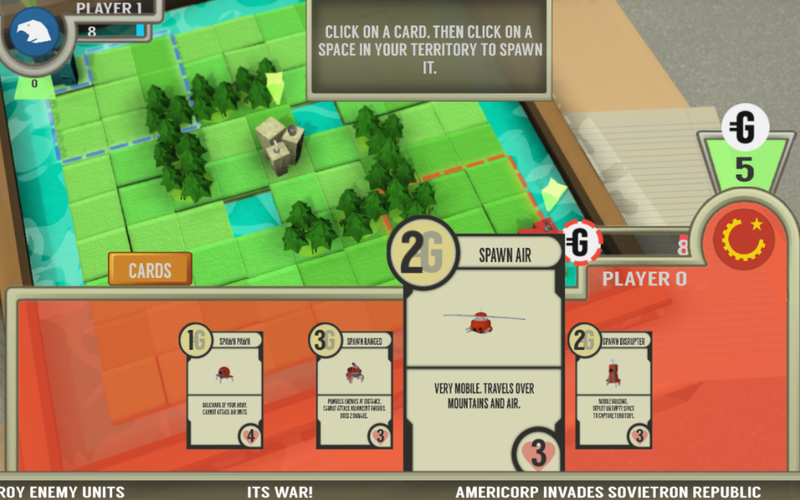 Every turn, the player gets an amount of Action Points that they can divvy up between their units. For instance, if you have 4 action points, you can move 2 units 2 spaces or 1 unit 4 space or 1 unit 3 spaces and another unit 1 space. This system makes the game very freeform. You've got to be on your toes. With Gibraltar, I really want to make sure that players can fit in a match wherever and whenever they want and still come out of it with a feeling of accomplishment. For this reason, the maps in Gibraltar are fairly small and victory conditions are simple. The time commitment required for a single match is something that really drives me away from some competitive games. It certainly adds a sense of importance to the game but I want Gibraltar to flow quickly, smoothly and elegantly. 6/8/16 -- Lots of changes! 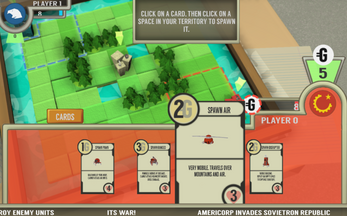 The biggest is that players now have access to powerful Action Cards that can be played during battle. Action Cards cost AP to play so you have to balance them with movement and combat. We revamped the UI to accommodate the card system (plus it just needed a revamp). 1-6-17 -- Happy New Year! It's been a crazy few months. Gibraltar has gotten a lot of love and polish on UI animations and textures, movement balance, new maps, tile sets, optimized unit models and animations and a working Hololens demo. I can't wait for everyone to play!